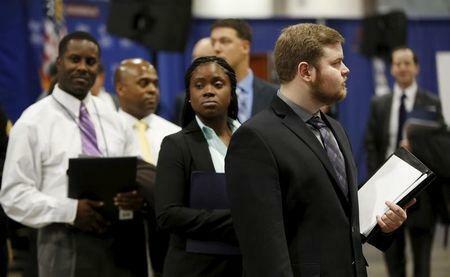 Initial claims for state unemployment benefits increased 17,000 to a seasonally adjusted 274,000 for the week ended April30, the Labor Department said. Last week's increase was the largest since February of last year. "We are assuming the move in claims is largely technical. By all accounts, businesses cannot find the skilled labor they need," said Chris Rupkey, chief financial economist at MUFG Union Bank in New York. Prices for U.S. government debt slightly pared losses after the data, while the U.S. dollar <.DXY> edged up against a basket of currencies. U.S. stock futures were trading higher. The latest claims data has no bearing on April's employment report as it falls outside the survey period. "It is not unusual to see heavy job cuts in a strong economy. Companies are constantly retooling, and sometimes the best time to do that is when the economy is strong," said John Challenger, the chief executive officer of Challenger, Gray & Christmas. Thursday's claims report showed the number of people still receiving benefits after an initial week of aid fell 8,000 to 2.12 million in the week ended April 23, the lowest level since November 2000.